Magnifying glass and pen on book; image by João Silas, via Unsplash.com. When it comes to translation, legal translation is one of the most challenging topics. Creativity is not enough when you need to translate legal terms. You need precise terminology to make sure that you keep the original meaning. There are many difficulties that can arise when you deal with a legal translation. There are various skills needed when you deal with legal translations. It is not enough to be proficient in two languages and to expect that the translation will come easy. On the contrary, a legal translator needs a high level of attention to details. Furthermore, he should do a lot of research to understand the particularities of the target audience and translate the document to be easily assimilated by them. Legal translations, more than any other type of translation, require a wide range of skills and qualifications from the translator’s side. A legal translator needs to capture every little nuance and tone to keep the original meaning of the legal text he is dealing with. In comparison to any other type of translation, this is a more complex job than any other type of writing. Thus, in addition to a deep understanding of the legal systems, a legal translator needs also an advanced language knowledge. This is how they are able to deliver a correct legal translation, which keeps the true meaning of the original content. A person who is doing legal translation is not a regular translator. Such a person needs extensive training and knowledge of the source language. What is more, it is highly recommended that the legal translator to be a native speaker of the target language. In that case, he will have detailed understand of the syntactic structure of the language and vocabulary specificities. Even though he will be translating technical terms, a legal translator still needs to understand the local culture. Furthermore, a legal translator is not a lawyer, but he should understand in detail the local legal system. All these can be achieved only through accreditation and training. Even though you translate a document, you need to keep the terms to their original meaning. Any deviation from the original terms may lead to a lot of loopholes and problems of understanding. Practically, you jeopardize the document’s importance for the target audience. Moreover, a legal translation must be balanced, fair, and consistent. In addition, a legal translation must be correct and keep the initial author’s voice. Therefore, it is very difficult to convey your point when you translate a legal document. As far as the tone is concerned, in general, legal translations follow a severe tone. 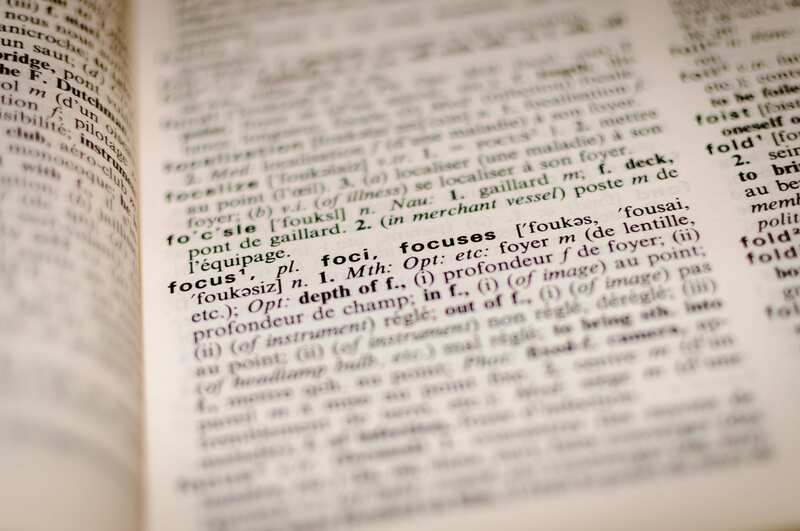 Dictionary page with the word “Focus”; image by Romain Vignes, via Unsplash.com. When it comes to legal translations, there are a lot of terms which are simply untranslatable. There are still a lot of legal terms coming from Latin, which many professionals keep using nowadays. In addition, when a term is specific to the law for a specific nation and is used only in legal documents, then it becomes very hard to translate it in a different language. Take as an example the term “habeas corpus”. This is a term used only in English and American legal systems. No other legal system uses this term, which makes it difficult to translate it in any other language. On the other hand, there are also terms which mean something in one country and a totally different thing in another. This is why a legal translator needs to be aware of legal jargon and try to adapt his translations in such a way that it fits in the new local context. The writers collaborating with PickWriters, offering legal translation services, mention the differences from various legal systems across various countries. Therefore, a legal translator does not only need to masterly handle the two languages, but he will also need to understand two different cultures and legal systems. Furthermore, even in the same country, legal translation can be challenging. For instance, what applies in England and Wales is no longer valid in Scotland. Therefore, for a legal translator, this is a huge challenge that he needs to overcome. It is difficult for a novice translator to pretend that he can be a professional when it comes to legal translations. It takes at least a couple of years to make sure that he will be able to deal with such a challenging task. As we already mentioned, legal translators need to develop a deep understanding of how various legal systems work. Thus, it is not enough to understand just their native legal system, but also the systems where the documents they work on come from. This is actually one of the reasons why some of the best translators in the market are former lawyers. Thus, gaining the necessary experience in this area can represent a challenge for a legal translator who wants to perform well. While the world is advancing with technology updates, legal translation still cannot keep the pace. The new digital approach can only work for big translation businesses which are handling large translation tasks. However, the number of large projects is very limited and thus technology cannot be used in most legal translations. In general, most translators still work on hard copies of the documents. This is an activity which is time-consuming and may be subject to errors. It is also very clear that human legal translators will never be replaced by software. However, the technology barrier will continue to exist, and legal translators need to adapt to the rigors imposed by the law. Legal translation is not an easy task. It needs a lot of expertise and precision if you really want to deliver an accurate document. It also requires years of experience and determination to become a professional and flawless legal translator. Kristin Savage nourishes, sparks and empowers using the magic of a word. Along with pursuing her degree in Creative Writing, Kristin was gaining experience in the publishing industry, with expertise in marketing strategy for publishers and authors. Now she has found herself as a freelance writer. She observes with a special interest how the latest achievements in media and technology help to grow readership and revenue and shares her opinion. You can find her on Facebook and Medium.